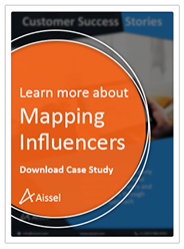 Aissel's KOL Mapping software built on Salesforce1 platform focuses on helping our life science customers discover and engage with the right Key Opinion Leaders. Our SFDC KOL Mapping application is an add-on to existing CRM, which can add great value to teams by providing constant customer insights. The SFDC KOL Mapping application integrates your account information with their profile information which can be accessed seamlessly without switching applications. This SFDC product brochure helps you understand the key features of the integration app and how you can enable your teams to continually be updated on their customer information. Healthcare Professionals have an extremely close knit community, where they constantly look up to their peers and more experienced HCPs for guidelines on clinical practices. While most national influencers who are prolific speakers and well published are generally known in the community, local influencers are hard to identify. This case study analyses the challenges of life sciences companies in identifying regional and local influencers and provides strategies that can be implemented to identify high-value practice leaders and local influencers without increasing costs. Identifying and mapping the right KOLs is the first step towards effective and impactful KOL Management. In the rapidly evolving healthcare space, life sciences companies need KOLs to create brand awareness and build credibility to their products. This Brochure helps you understand the Top 5 cutting edge and innovative feature of our Software Platform and paves the way for effective KOL Management.